Cerium is one of the most important lanthanide elements based on its characteristics and wide range of related applications. Cerium is the second element in the lanthanide series, and mostly can be found in either +3 or +4 ionization states. It can be considered one of the rare earth elements with relatively low toxicity and a lot of biological applications depending on its redox (reduction-oxidation) process between the +3/+4 ionization states and oxygen storage capability. This book focuses on the cerium compounds such as oxides and silicides, with detailed studies about its structures, characterizations and related applications. 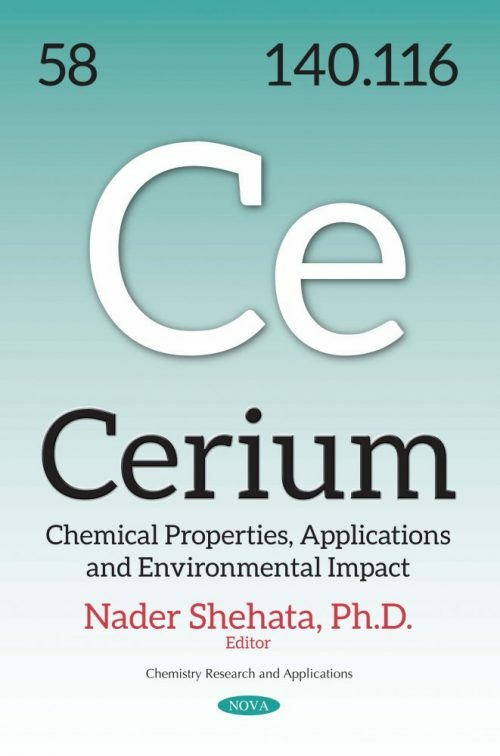 Chapter One mainly presents some optical characteristics of stoichiometric ceria nanoparticles – whether undoped or doped – with some other lanthanide elements. Then, some applications of ceria nanoparticles, such as optical nanosensors and solar cell coaters, are discussed based on optical characteristics of CeO2-x. Chapter Two studies the catalytic activity of cerium dioxide (CeO2) included within nanophase (nanocomposite) metal-oxide systems such as Al2O3/cordierite carriers and prototypes of anode materials for SOFCs (based on stabilized zirconia), within different processes of environmental catalysis. CeO2 increases stability of the Ni-Al2O3 catalysts by suppressing surface carbonization and enhancing resistance to poisoning by sulfur compounds. Cerium dioxide as a modifying additive within the ZnO–CuO–CeO2/Al2O3/cordierite catalysts is shown to stabilize their operation in the decomposition of methanol by suppressing surface carbonization, thereby facilitating hydrogen formation as the target product. In Chapter Three, another cerium-dependent compound –cerium silicide (CeSix) – and its nanowires were investigated over a broad range of different cerium monolayers on Si(110)-16×2 surfaces via scanning, tunneling, microscopy and spectroscopy. The growth progress of the CeSix nanowires undergoes a coverage-dependent metal-insulator-metal electronic transition, which has never been found in other rare-earth silicide nanowires. suppressing surface carbonization, thereby facilitating hydrogen formation as the target product. Moreover, the insulating CeSix nanowires have been structurally and electronically studied, without lattice distortions with large Coulomb repulsion energy between the filled and empty surface bands. Thus, the insulating phase of atomically precise CeSix nanowires is an electronically driven phase because of its temperature and structure independence. Chapter Four is mainly concerned with some biological applications of ceria nanostructures through the treatment of diseases characterized by increased oxidative stress levels. This chapter offers a study of consumption and occupational exposures, and consequently its toxicology properties are discussed due to the recent applications of nanoceria as a high priority material for toxicological evaluations.